RHS exhibition: 10 weeks to go! The weather isn’t getting any easier yet, in fact, today whilst painting in my shed I got quite scared. That is not me! The sun had been shining, but a large cloud was beginning to darken the sky. Suddenly it started blowing so much that the shed was actually shaking. I have never experienced that before. Even the cats sat up and took notice. I am ploughing on with the pictures for the RHS exhibition in London in April. 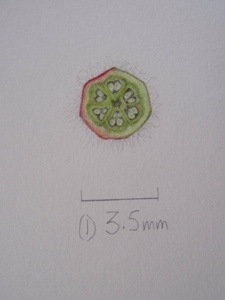 I now have the Malus Everest picture finished – I think. I have used exactly the same type of dissections for this painting as the other one. You saw the longitudinal section of the last picture. Guess what this is. 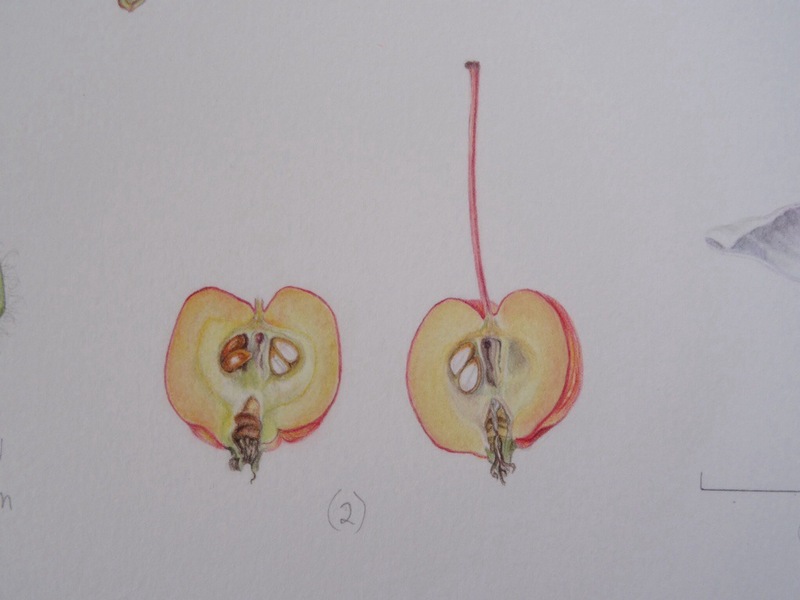 You know which crab apple this is, so try and see which part it is. All the pictures are being done in coloured pencil. I had thought to do the dissections in graphite, in the same way as in other illustrative paintings. However, I have chosen to continue them in colour in this series of paintings. < RHS exhibition: twelve weeks to go!